The Quadrail can be used as a stand alone support for plants, as a decorative protection for trees or to give a little height in your flower borders. The Quadrail is made from lengths of Scandinavian Red Pine which are nailed, glued and treated with a high quality, plant friendly, water repellent stain/preservative. With care, this plant support will last for many years. We also supply our Quadrail with eyelets and spikes to secure them to the ground. You can only use these if you are positioning the Quadrail on soil or grass. 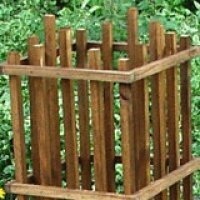 Wooden garden obelisks can serve numerous functions. In a flower garden, they provide support for flowers such as climbing roses, clematis, morning glories and many other plants. In the vegetable garden, various kinds of vining fruits and vegetables can be cultivated on them including various types of beans. Obelisks will provide four season interest and focal points in the garden, plus they make your garden look as though it was designed by a professional. Garden obelisks come in various sizes and shapes. Typical shapes include tall, oblong forms, rectangular forms, and pyramids. Plants will take to any shape so choose the design that's pleasing to you and blends with your garden. Obelisks are typically found in more formal garden layouts. 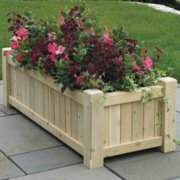 They create a focal point in the garden all year long. A focal point can be created in a number of ways. Statues, obelisks, and fountains, in addition to special trees and shrubs are often used as points of interest. Since your obelisk will be, at least, one of your focal points, you should take your time choosing the perfect one for you and your garden. a sturdy obelisk which will be a blaze of colour through the whole summer season. Clematis also needs a support of some type, and an obelisk creates a massive tower of purple, white or reddish pink blossoms, depending on the variety of clematis. If you'd prefer an annual flower, try growing morning glories on an obelisk. Whether you're looking for an obelisk to accent a garden path, add colour and beauty to a vegetable garden, or create an instant focal point, obelisks are a classic way to add interest to the garden. They make a statement with or without plants growing over them - just be sure to place them where you can enjoy their presence on a daily basis.